While it’s impossible to predict the future with complete accuracy, the IDC Market Spotlight offers several clues about the evolving consumer goods landscape and how brands can best prepare for it. In this post, we’ll summarize a couple of the report’s key predictions and offer advice for how brands can meet these changes head-on. Historically, established brands didn’t have much to fear from new market entrants, because the startup costs of manufacturing, warehousing, logistics, and marketing were very high. It wasn’t easy to break into an industry, and new companies certainly didn’t gain traction overnight. Having established business processes and relationships with retailers were key foundations of success, and also inoculated brands against new entrants. At the same time, brands and retailers held the power to dictate market terms and activities. Now, however, things have changed a lot. Many of the elements that once took months or years to get into place, like manufacturing, are offered on-demand or as-a-service. A single viral meme can accomplish in a week what used to require months of marketing. E-commerce offers an easy, direct channel to consumers, without a retailer in the middle. And most importantly, consumer demand now drives the market, meaning that brands out-of-sync with consumer preferences quickly fall behind. For all these reasons, the key components of success for brands have changed: now, it’s most important to be able to rapidly monitor — and respond to — consumer demand. If you don’t listen to what your consumers want, someone else will, and you could find yourself faced with a disruptive and fast-growing new competitor. The companies that thrive will be those that can capture and react to consumer preference data; consumer demand is a great equalizer. 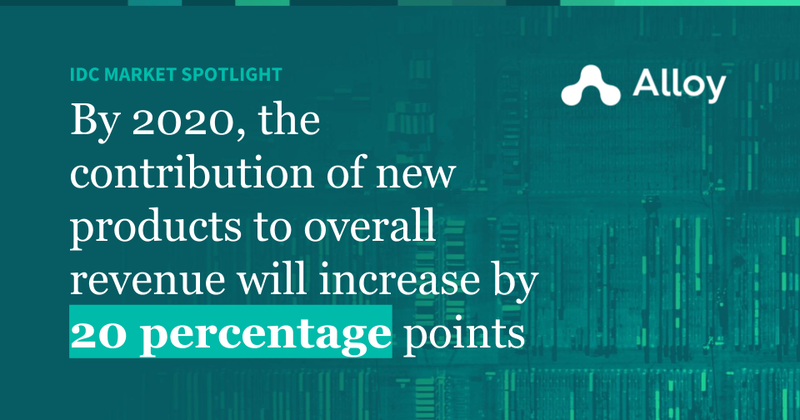 The IDC Market Spotlight predicts that, by 2020, the contribution of new products to overall revenue will increase by 20%. Rather than relying on products that have sold well for years, brands will become increasingly dependent on the success of their new innovations. In this type of environment, it will be more important than ever for brands to quickly gauge and react to consumer response. If a new product is doing particularly well — or if it isn’t — companies will need to know as soon as possible so they can react accordingly, maximizing sales opportunities and minimizing markdowns. Additionally, as SKUs begin to churn more quickly, it will be crucial to collect and analyze detailed data on product performance to help inform future product development and launch strategies. The driver behind this change is, once again, the increasing importance of consumers as a market force. With more product options and channels available to them than ever before, today’s consumers want products tailored to their specific needs and preferences. As those needs and preferences change, brands will need to match pace in order to succeed. One of the most important takeaways from the IDC Market Spotlight is that these changes to the manufacturer landscape aren’t part of some distant future, twenty years down the line — they’re here already. Luckily, the changes brands should make to adapt don’t have to be drastic; as a first priority, they must embrace true demand data as an all-important component of supply chain and sales. With digital transformation and a demand-driven perspective, brands can continue to focus on their unique product differentiators, empowered by the volume of data available rather than encumbered by it. Is your brand prepared for tomorrow’s selling environment, and the consumer-centric changes that will define it? To learn more about how you can harness the power of data and consumer demand insights to your advantage, reach out to schedule a demo of Alloy’s platform today.